If you are lucky enough to know how to play piano, you'll appreciate the effect that good playing has on an audience. A Pianist is the ideal musical accompaniment for any event where you want your audience to relax and enjoy the entertainment on offer. Musical styles vary from jazz piano to easy listening, current rock and pop and old favourites - so they are versatile and adaptable performers. They are used to performing in a wide range of settings, and understand how to relate to a crowd. For those who love the music of the 80's, Mr Billy Joel, is due to tour again, reviving interest in those beautifully crafted songs with fabulous piano accompaniment. It's a musical style which is very much in fashion at the moment and is guaranteed to please. So whether they perform as a solo artist, or bring their own band, a pianist will hit the right notes for all your guests and create a memorable party. Find out more about booking a pianist below. Find a Pianist / Keyboardist for hire near you in minutes! Option 1. Enter your event location below & contact a Pianist / Keyboardist directly! Option 2. Request multiple quotes from available Pianists / Keyboardists Get Quotes! Option 3. Read information & advice on hiring Pianists / Keyboardists Read Advice! From delicate high notes to booming low notes, the piano has it all. Of all the musicians for hire on Entertainers Worldwide few other instruments come close in terms of power, dynamics and versatility of a piano. When you book a Pianist for your event, you can revel in the sublime music of classical composers such as Beethoven and Schubert, or relax to the mellow sounds of Oscar Peterson and Diana Krall. To get your party started, you can get everyone dancing to jazz greats like Duke Ellington and Count Basie or rock ‘n’ roll superstars like Jerry Lee Lewis and Little Richard. It’s impossible to imagine life without these amazing artists but luckily, our talented musicians are on hand, just waiting to bring a slice of that piano magic to your event! Below is a quick guide to hiring a keyboard player or pianist and what to expect from your act. For more detailed information including how to book, how much space you’ll need and the nitty-gritty of making sure your event booking goes perfectly, take a look at our Complete Guide to Booking a Musician. WILL THEY BE RIGHT FOR MY EVENT? As the piano covers so many different styles, it helps to narrow it down a bit and think about whether you’re looking for upfront live music or quieter background music. Classical and jazz pianists are perfect for cocktail parties, after-dinner entertainment, drinks receptions, lobbies, cafés and restaurants. Rock and pop piano players, usually with vocals, are great for parties and wedding receptions, where you want people to be dancing and maybe singing along, and where you want live music to be a real feature. Another thing to consider if you’re thinking about booking a Pianist is whether or not there is a suitable instrument already at the venue. In terms of size, acoustic pianos, both uprights and grand pianos, are tricky to transport and require careful handling, as well as tuning by a professional once in place. A more practical option for many situations is a digital keyboard. This is by no means a bad option. Today’s digital pianos use real piano samples and have weighted keys, to replicate the sound and dynamic range of a real piano, with amazing accuracy. In fact more and more of some of these influential pianists have endorsed electronic pianos and keyboards. A pianist hired for a classical concert or recital may prefer to play on an acoustic piano, in which case you’ll need to have one at the venue, or potentially pay a lot for hiring one. For rock, pop and jazz gigs, a digital keyboard will be fine and your keyboardist will provide this, along with a suitable PA system. So, if your venue has a decent piano in-situ, why not take advantage and book a Pianist? If it doesn’t, speak to your musician and find out if they can bring a digital keyboard. Don’t forget, digital keyboards and PA systems will need a power source, so make sure there are at least two 13-amp power sockets near the stage area. Nothing creates a warm atmosphere on your big day quite like the tinkling of the ivories and piano players are hugely popular at weddings, where they are versatile enough to create just the right ambience for different stages of the day. A Pianist can play soothing music as guests arrive and take their seats. For a traditional ceremony, they can play classical pieces such as Pachelbel’s ‘Canon in D’ or Wagner’s ‘Bridal Chorus’ as you walk towards your beloved. For something more contemporary, you could be gliding down the aisle to ‘Just the Way You Are’ by Billy Joel. As the ceremony ends and guests begin to mingle, they can lift the mood with up-tempo piano arrangements of ‘All You Need is Love’ by the Beatles and ‘Brown Eyed Girl’ by Van Morrison. This is a great way to create a relaxed atmosphere while your guests socialise inbetween photos, speeches and cutting the cake. A pianist can provide the perfect backdrop to your wedding breakfast and drinks reception with mellow jazz numbers like ‘Let There Be Love’ by Nat King Cole, ‘Sentimental Mood’ by Duke Ellington and ‘They Can’t Take That Away From Me’ by Gershwin’. What could be more romantic! For your first dance, what could be more perfect than a jazz classic such as ‘Moon River’ by Johnny Mercer, ‘What a Wonderful World’ by Louis Armstrong or ‘The Way You Look Tonight’ by Dorothy Fields and Jerome Kern. Or you can get everyone up and dancing to an upbeat rock and pop mega hit like ‘Every Little Thing She Does is Magic’ by The Police or ‘Marry You’ by Bruno Mars. It’s your wedding, so do whatever feels right and don’t hold back! A professional Pianist is the perfect way to make an impression at a formal dinner for clients, VIP event, award ceremony or annual conference. Equally, a Pianist tinkling away gently as your guests mingle at an after-dinner cocktail party or drinks reception is just the thing to create a relaxed, yet sophisticated backdrop. Live music is hugely important for enhancing the atmosphere at fundraising events, bringing a warm and lively feel to the occasion, thrilling guests and creating a buzz. If you’re planning a birthday bash, retirement party, leaving do, hen do or office party, you can’t go wrong with a rock and pop Pianist. With a set list covering everything from Elton John’s ‘I’m Still Standing’ to ‘Isn’t She Lovely’ or ‘Happy Birthday’ by Stevie Wonder, they will energise the crowd, break the ice, get people dancing, singing along and generally letting loose. If you’re hosting a sophisticated drinks reception or cocktail party, a Pianist can provide the perfect accompaniment, warming the atmosphere with some mellow jazz numbers, tinkling away as guests mingle and sip champagne. So, for everything from up-tempo classics and current hits, to ballads and broadway tunes, you can rely on a keyboard player to make your guests smile. From little ones to grandmas, they’ll be humming tunes all the way home. 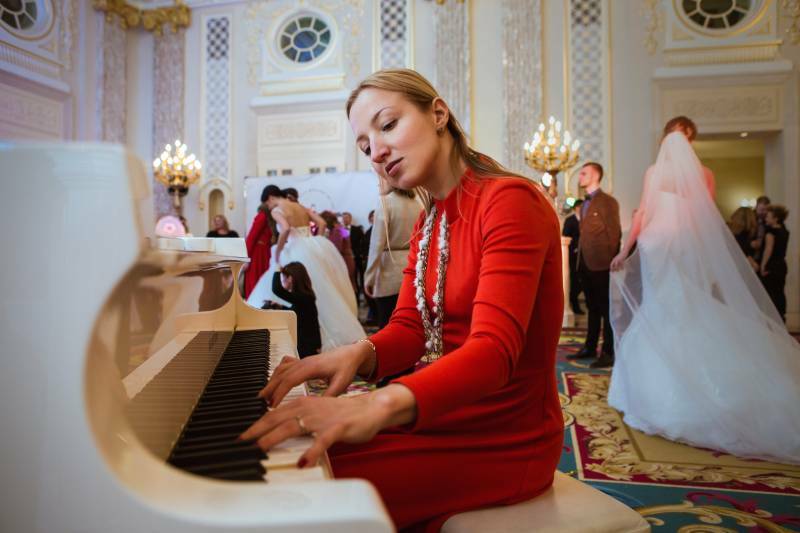 You can also choose a Pianist to really enhance the theme of your event, be it a ‘60s rock-and-roll party or Christmas special with those favourite festive songs. They can also be combined with a DJ to provide entertainment for all-day events and festivals. Another fantastic way to keep your guests smiling is to ask your Pianist if they can include a karaoke-style element in their set. They can take requests and play along with guests as they sing their favourite songs. Anyone who loves a good sing-along will love this! One sure fire way to stand out at an exhibition, trade show, store opening or product launch, is to hire a Keyboardist. People will hear the music and move towards your stand, where they will want to stick around, enjoying special arrangements of classical pieces, jazz favourites, classic hits or current chart-toppers. Just don’t be surprised if you start a sing-along! Your hired Pianist can tailor their set list to fit perfectly with your product or brand, and can even wear a T-shirt or hat emblazoned with your company logo. A live keyboard player will not fail to warm the crowd and make you stick in people’s minds. HOW MUCH WILL HIRING A PIANIST COST? The cost of will depend largely on how experienced they are and how far they have to travel to your event. In all instances, professional musicians will have been studying their instrument from an early age and will continue to invest time and money in developing their talent and repertoire, and perfecting their act. The fee for a basic set (typically 2 x 45 minutes) ranges from £150 to £500 in the UK ($500 in the U.S. and €570 in Europe). High-profile performers will cost more, as will bookings during Christmas and New Year. The quickest way to find the right musician to book in your area is to use our simple search function. Just add your location and click search to see a huge variety of acts to choose from. Our latest testimonials are also a fantastic way to start getting some ideas for your shortlist. Once you’ve found your ideal act, just contact them direct! Even better, if you would rather entertainers came to you, you can request multiple quotes here, and this service is completely free! Booking a Pianist or Keyboardist can make all the difference to your event, and we know we have exactly the right performer on here waiting to fill your party or event with energy and smiles. We hope you enjoy your search but do contact us if you need any help. WANT TO RECEIVE A RANGE OF QUOTES FROM Pianists / Keyboardist?